The Shaggy Dog is a black-and-white 1959 Walt Disney film about Wilby Daniels, a teenage boy who by the power of an enchanted ring of the Borgias is transformed into the title character, a shaggy Old English Sheepdog. The film was based on the story The Hound of Florence by Felix Salten. It is directed by Charles Barton and stars Fred MacMurray, Tommy Kirk, Jean Hagen, Kevin Corcoran, Tim Considine, Roberta Shore, and Annette Funicello. This was Walt Disney's first live-action comedy. Walt Disney Productions filmed a successful sequel in 1976 called The Shaggy D.A. which starred Dean Jones, Tim Conway, and Suzanne Pleshette. It was followed by a 1987 television sequel, a 1994 television remake and a 2006 live-action theatrical remake. Wilbur "Wilby" Daniels is a boy who is misunderstood by his father, Wilson. Wilson thinks Wilby is crazy half the time because of his elder son's often dangerous inventions. As a retired mailman who often ran afoul of canines, he is allergic to dogs, and he simply cannot understand why his younger son, Montgomery "Moochie" would want a dog. Wilby and his rival Buzz Miller go with a French girl named Francesca Andrassé to the local museum. Wilby gets separated from the other two, who leave without him. Wilby encounters former acquaintance Professor Plumcutt (whose newspaper Wilby used to deliver), who tells him all about mystical ancient beliefs, including the legend of the Borgia family, who used shape-shifting as a weapon against their enemies. On the way out, Wilby collides with a table that holds a display case of jewelry. He accidentally ends up with one of the rings in the cuff of his pants. It is the cursed Borgia ring, and no sooner does he read the inscription on it ("In canis corpore transmuto", which, unknown to Wilby, means, "Into a dog's body I change") then he transforms into The Big Shaggy Dog Name Chiffonn, Francesca's shaggy "Bratislavian sheepdog". Confused, Wilby as a dog goes to Professor Plumcutt, who says he has invoked the Borgia curse upon himself, which can only be broken through a heroic act of selflessness. After getting chased out of his own house by his enraged father (who fails to recognize him as a dog), Wilby has a series of misadventures while switching back and forth between human form and dog form. Only Moochie and Professor Plumcutt know his true identity, as Wilby has spoken to them both in dog form. While at a local dance in his human form, he accidentally transforms himself into a dog. The next day, Wilby, as a dog, and Moochie are talking when Francesca's butler Stefano comes out and drags Wilby into the house. Stefano and Francesca's adoptive father, Dr. Valasky, are discussing plans to steal a government secret, and Wilby, as a dog, overhears. Unfortunately for him, he transforms into human Wilby right in front of the spies and has been discovered, but not before he hears Dr. Valasky expressing his wish to get rid of his own daughter. The spies angrily capture Wilby and force Francesca to leave with them, leaving the human Wilby bound and gagged in the closet at once. Fortunately, Moochie sneaks into the house just after Dr. Valasky, Stefano and Francesca leave, and discovers Wilby, who is transformed into a dog, still bound and gagged in the closet. Wilby reveals the secret to his dumbfounded father, who goes to the authorities, until Wilson suddenly finds himself accused of being either crazy or a spy himself. When Buzz appears at the Valasky residence to take Francesca on a date, Wilby, still in his dog form, steals Buzz's hot rod automobile. Buzz reports this to Officers Hansen and Kelly, who are in disbelief until they see the shaggy dog driving Buzz's hot rod. Wilson and Moochie follow Buzz and the police, who end up chasing everyone. The spies attempt to leave aboard a boat, but the police call in the harbor patrol to apprehend Dr. Valasky and stop his boat. Wilby, in his dog form, swims up and wrestles with the men, as Francesca gets knocked out of the boat. He then saves her life and drags her ashore, which finally breaks the curse of dog form. When Francesca regains her consciousness, Buzz tries to take credit for saving her. This angers Wilby, who is still a dog, so much that he attacks Buzz. Seconds later, Buzz is surprised to find himself wrestling with the real human Wilby, and the real Chiffon reappears. Since he is soaking wet, Francesca concludes that he has really saved her from the ocean and she hugs and praises Chiffon. Now that Wilson and Chiffon are declared heroes, Francesca is able to leave for Paris without her evil adoptive father and former butler, both of whom have been arrested for illegal espionage; and she gives Chiffon to the Daniels family for them to keep as her way of thanking them. Since Wilson has gotten such commendation for foiling a spy ring because of "his love of dogs", he has a change of heart over his allergy to dogs, a promise to change his ways, and a sense of humor (while he also realizes that his dog-hating attitude isn't really good anymore), so he allows Moochie to care for Chiffon as he wanted a dog all along. Wilby and Buzz decide to forget their rivalry over Francesca and resume their friendship instead. In the late 1950s, the idea of an adult human turning into a beast was nothing new, but the idea of a teenager doing just that in a movie was considered avant-garde and even shocking in 1957 when AIP released their horror film, I Was a Teenage Werewolf, one of the studio's biggest hits. The Shaggy Dog betrays its successful forebear with Fred MacMurray's classic bit of dialogue: "That's ridiculous—my son is not a werewolf! He's nothing more than just a big, baggy, stupid-looking shaggy dog!" The movie was originally intended as the pilot for a never-made TV series and advertised as "the funniest shaggy dog story ever told", although it is not in fact a story of that genre. The director was Charles Barton, who also directed Spin and Marty for The Mickey Mouse Club. Veteran screenwriter Lillie Hayward also worked on the Spin and Marty serials, which featured several of the same young actors as The Shaggy Dog. 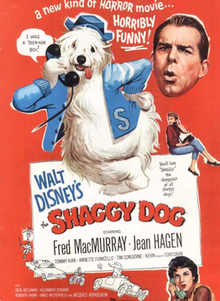 Disney producer Bill Walsh mused that "The Shaggy Dog" was the direct inspiration for the TV show My Three Sons, Walsh said "Same kids, same dog and Fred MacMurray!" Veteran Disney voice actor Paul Frees had a rare on-screen appearance in the film – for which he received no on-screen credit – as Dr. J.W. Galvin, a psychiatrist who examines Wilby's father (MacMurray), Wilson Daniels. Frees also did his usual voice acting by also playing the part of the narrator who informs the audience that Wilson Daniels is a "man noted for the fact that he is allergic to dogs." While the movie itself is based on Salten's The Hound of Florence, a novelization of the movie published by Scholastic eight years later in 1967 made some interesting changes to the plot. First, Funicello's character Allison was removed entirely, and her name is not listed among the movie's principal performers. As a result, the rivalry between Wilby and Buzz is greatly reduced. Also, Dr. Valasky is changed into Franceska's uncle, not her adoptive father. A comic book adaptation also appeared from Western Publishing Company, which followed the movie's storyline more closely. This was reprinted in 1978 as a companion story to an adaptation of The Cat from Outer Space. The Shaggy Dog was at that time the most profitable film produced by Walt Disney Productions, which influenced the studio's follow-up live-action film production. Using a formula of placing supernatural and/or fantastical forces within everyday mid-twentieth century American life, the studio created a series of "gimmick comedies" (a term used by Disney historian and film critic Leonard Maltin) with action to keep children entertained and some light satire to amuse the adult audience. Using television actors on their summer hiatus who were familiar to audiences but did not necessarily have enough clout to receive over-the-title billing (or a large fee) from another major studio was one way these comedies were produced inexpensively; they also tended to use the same sets from the Disney backlot repeatedly. This allowed Walt Disney Productions a low-risk scenario for production, any of these films could easily make back their investment just from moderate matinee attendance in neighborhood theatres, and they could also be packaged on the successful Disney anthology television series The Wonderful World of Disney. The initial release of The Shaggy Dog grossed more than $9 million on a budget of less than $1 million—making it more profitable than Ben-Hur, released the same year. The Shaggy Dog also performed very strongly on a 1967 re-release. The popular television series My Three Sons (1960–1972) reunited MacMurray and Considine, and also features a pet shaggy sheepdog named "Tramp". The film was followed in 1976 with a theatrical sequel, The Shaggy D.A., starring Dean Jones as a 45-year-old Wilby Daniels. In 1987, a two-part television movie set somewhere in the 17 years between the events portrayed in The Shaggy Dog and The Shaggy D.A., entitled The Return of the Shaggy Dog, presented a post–Saturday Night Live Gary Kroeger as a 30-something Wilby Daniels. In 1994, the first remake of the film was a television movie, with Disney regular Scott Weinger as a teenaged Wilbert 'Wilby' Joseph Daniels, and Ed Begley, Jr. playing a part similar to the one originated by Fred MacMurray in 1959. In 2006, Disney released a live-action remake of the movie with Tim Allen as a 50-something Dave Douglas. This film has an entirely different story, characters, and transformation plot device unrelated to the original trilogy. To tie-in with the theatrical release of the 2006 remake, the original 1959 movie was re-issued in the US as a special DVD labeled The Wild & Woolly Edition, which featured the movie in two forms: one in the original black and white, the other a colorized version. The colorized version however is not restored and suffers from age. In the UK, however, the 1959 movie has only ever been made available on DVD in black and white. The 2006 remake and Tim Allen's performance was poorly received by critics, with a moderately successful box office return. ^ Cohn, Lawrence (October 15, 1990). "All-Time Film Rental Champs". Variety. p. M184. Arkoff, Sam (1992). Flying Through Hollywood by the Seat of My Pants: The Man Who Brought You I Was a Teenage Werewolf and Muscle Beach Party. Birch Lane Press. ISBN 1-55972-107-3. Wills, John (2015). "Felix Salten's Stories: The Portrayal of Nature in Bambi, Perri and The Shaggy Dog". In Jackson, Kathy Merloch; West, Mark I. Walt Disney, from Reader to Storyteller: Essays on the Literary Inspirations. Jefferson (N.C.): McFarland. pp. 45–61. ISBN 978-0-7864-7232-1. This page was last edited on 16 April 2019, at 11:18 (UTC).